Last week Sefiani Communications Group and our client EY won the coveted Mumbrella CommsCon B2B Campaign of the year award for our joint campaign on the University of the Future. 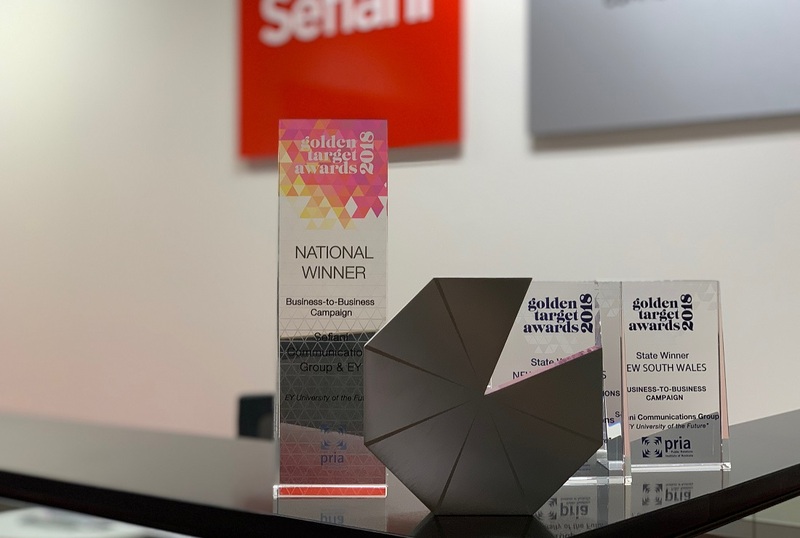 This caps off an outstanding run for this campaign, which has also picked up a national Golden Target award as B2B Campaign of the Year and state Golden Target Awards for Corporate Communications and B2B Campaign of the Year. But what makes an award-winning B2B campaign in our increasingly cluttered media landscape? This campaign was competing for the scarce attention of senior business leaders in Australian Universities, so we knew we needed to take a different approach to pique their interest. Teaming up with our client EY, we developed a comprehensive communications strategy which would cut through the noise by targeting the key stakeholders for this campaign not just where they worked, but where they live. From an earned media perspective, we didn’t just settle for interviews with The Australian and the Sydney Morning Herald – we stretched beyond the usual corporate media suspects and targeted opportunities with more consumer-facing outlets, like the Today show, The Daily Mail and talkback radio. Reflecting this on digital and social media was crucial. Conversational, engaging calls to action and dynamic content across social media platforms like LinkedIn targeted these senior leaders to give them access to digital copies of EY’s University of the Future report. This campaign wouldn’t work without a spokesperson who was prepared to have the challenging conversations, and Catherine Friday, at the time EY’s Oceania Education Leader was dynamic, articulate and clear in her point of view, backed by our agile colleagues in EY’s Brand, Marketing and Communications team, like Thomas Klupsch who led the campaign and Melanie Kent who led the media relations elements. Being able to build incredibly close and trusted relationships with our colleagues at EY has been essential to the success of this campaign as well. Together, these elements ensured that the campaign was able to create significant business impact for EY, demonstrating that the right approach to media relations and digital media can deliver astounding results in a cluttered world.